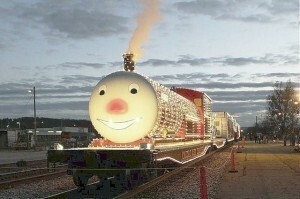 The KCS Christmas Train carrying Santa Claus and his elves will be in Jefferson Texas on Friday November 23, 2012 starting at 4PM until 7PM, NO tickets required; it’s free to the public. The train will be parked on the tracks between E Austin St and Lafayette St.
Holiday Express is a six-car train led by KCS’ Southern Belle business train; the Holiday Express includes “Rudy” a smiling tank car a flatcar carrying Santa’s sleigh, reindeer and a miniature village; a ginger bread boxcar; the elves’ workshop; the reindeer stable; and a little red caboose. In 2001 the KCS Lines Holiday Express train was created by volunteers who dedicated over 8,000 hours to transform the six retired rail cars including brilliant lights and festive music that complete the whole package. Plus at each scheduled stop, The KCS Charitable Fund makes a contribution of gift cards to the local Salvation Army to provide warm clothing and other necessities for children in need. After you have seen the train make sure to go to the Tree Lighting Ceremony up at Lions Park at 7:30 PM.